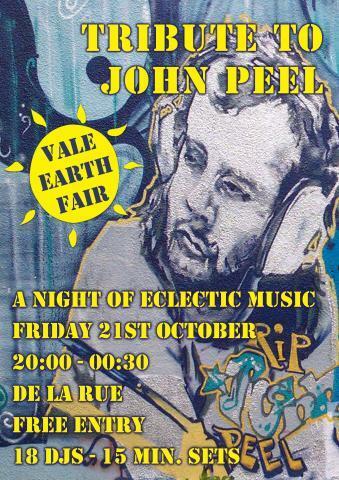 It's that time of year again - this year's Vale Earth Fair has finally been put to bed and the Collective have recovered and from the summer excesses, so it's time to start raising money for next year, kicking off with the annual tribute to the world's most influential radio DJ, John Peel. It's been 12 years since his untimely death, and true to his spirit we have selected 18 music lovers to play music that inspires them across multiple genres. It's very much a case of no rules as our budding DJ's play you 15 minutes of the music they think you should be listening to - much as John Peel did. Expect a diverse selection of tunes - some that you will know, some you won't - prepare to be educated! It's all going down at the Thomas De La Rue pub on Friday 21st October, free entry (donations welcome), 8pm start.